Francis Cissna, Citizenship and Immigration Services (USCIS) director, speaks during a briefing at the White House in December 2017. WASHINGTON - The Trump administration is preparing to shutter all international offices of U.S. Citizenship and Immigration Services, a move that could slow the processing of family visa applications, foreign adoptions and citizenship petitions from members of the military stationed abroad. 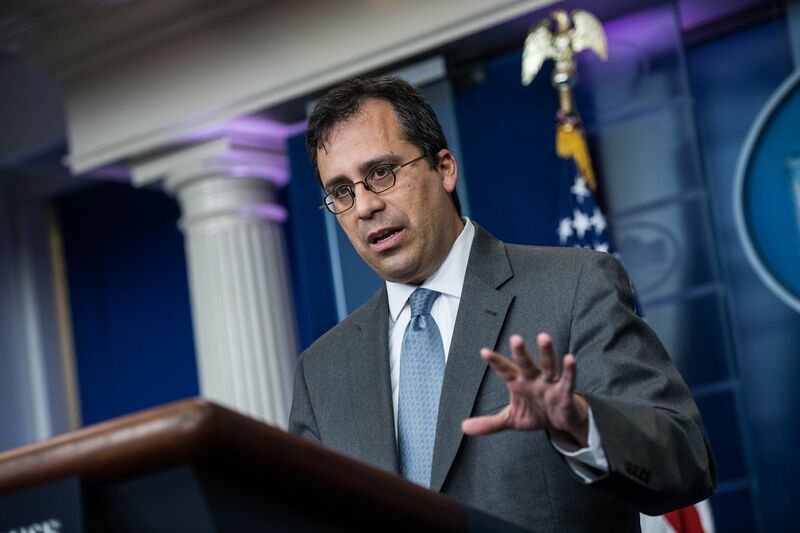 USCIS Director Francis Cissna said in an email to staffers Tuesday that he is working to transfer those duties- now performed by employees worldwide - to domestic offices and the State Department's embassies and consulates. He wrote that if the State Department agrees, the agency would move to close its international field offices in coming months "in an effort to maximize our agency's finite resources." "I believe by doing so, we will better leverage our funds to address backlogs in the United States while also leveraging existing Department of State resources at post," he wrote. "Change can be difficult and can cause consternation. I want to assure you we will work to make this as smooth a transition as possible for each of our USCIS staff while also ensuring that those utilizing our services may continue to do so and our agency operations continue undisrupted." The shift will ripple to offices in New Delhi; Port-au-Prince, Haiti; Rome; and numerous other foreign cities where the agency has offices that handle emergencies, alleviate backlogs in immigration petitions and provide direct information in foreign languages. USCIS international offices also investigate fraud. Officials said there are more than 20 offices, including several in Mexico, two in China, and one that was set to open in Addis Ababa, the capital of Ethiopia. Administration officials say the move will allow them to shift resources to slash backlogs in the United States, and they estimate the government will save millions of dollars each year by phasing out USCIS international offices. But immigration advocates worry it is another Trump administration effort to discourage foreigners from attempting to come to the United States, and experts say closing the offices will shrink the nation's engagement with the rest of the world. "It is a pullback from the international presence of USCIS," said Leon Rodriguez, a USCIS director during the Obama administration who has hosted naturalization ceremonies for military families in Frankfurt, Germany, and Rome. "It's in keeping with this isolationist bent that this administration has had more broadly." The State Department issued a statement Tuesday to say that it has long worked in close cooperation with USCIS at home and abroad and that it will coordinate closely with USCIS if it reaches an interagency agreement to take on the roles the offices have played. "Consular Affairs proudly provides services on USCIS' behalf at more than 200 posts worldwide," the State Department statement said. "Should USCIS overseas offices be phased out, we anticipate a smooth transition and continued efficient processing of USCIS-related work at all of our missions overseas." Generally, the offices in other countries facilitate applications from potential U.S. immigrants. Closing the offices would reassign about 70 USCIS staffers across the world who the agency's website says provide "valuable information services" and solve a wide array of problems, such as aiding someone who lost a green card and helping widows of American citizens and members of the military obtain legal documents. Advocates for families attempting to adopt internationally say the immigration agency added expertise and a collaborative approach they did not always find in the consular corps. "These are services that U.S. citizens are paying for," said Ryan Hanlon, vice president of the Virginia-based National Council For Adoption, noting that USCIS runs on fees from immigrants and U.S. citizens. "It shouldn't be more complex." But Jessica Vaughan, a former consular officer and current policy director at the Center for Immigration Studies, which favors stricter immigration controls, said State Department officers are well-equipped to handle those duties. "It's really a better fit for the State Department to be performing this very critical function, and it's very expensive for CIS because they've got to send an employee overseas," she said. "The State Department is already there." The move comes as the Trump administration is pressing to tighten the nation's immigration controls and shift from family reunification to merit-based immigration. Department of Homeland Security officials say it is part of an overall effort to streamline U.S. immigration operations. A senior DHS official who spoke on the condition of anonymity to describe a decision that has yet to be publicly announced said it was primarily a cost-saving measure that will hand off responsibilities to State Department and DHS personnel working abroad. The USCIS International Operations Division, created under the Refugee, Asylum, and International Operations Directorate, has about 240 employees in the United States and in two dozen field offices in more than 20 countries. It is "charged with advancing the USCIS mission in the international arena," according to materials on the agency's website. "Reuniting families, enabling adoptive children to come to join permanent families in the U.S., considering parole requests from individuals outside the U.S. for urgent humanitarian reasons or significant public benefit, and providing information services and travel documents to people around the world - all with unique needs and circumstances - are just a few of the responsibilities our officers assume on a daily basis," USCIS says. The agency also investigates fraud, aids asylees and refugees, and provides public information in local foreign languages. More than half of the overseas USCIS staff members are foreign nationals, and the local contract employees who perform many of the applicant screenings are likely to continue doing so under State Department supervision, a DHS officials said. If the State Department agrees to take over those duties, American employees in international offices would transfer back to the United States. Officials said USCIS would still provide services from U.S.-based offices and visits abroad. Refugee processing would not be affected because a different unit handles that function, officials said. But immigration lawyers and others were skeptical, saying the Trump administration has delayed application processing and heightened scrutiny of applications that used to clear quickly, keeping foreigners from being able to work, study and join their families in the United States. "This is not an immigration-friendly administration," said George Bruno, a Manchester, New Hampshire, immigration lawyer and former ambassador to Belize. "The service currently being provided is awful, and I can only imagine it's going to deteriorate further with these office closures." In his email, Cissna said in his message to staff that he also would consolidate regional, district, and field offices in the United States in coming weeks "to streamline management structures, balance resources, and improve our overall mission performance and service delivery." The Washington Post’s Carol Morello contributed to this report.